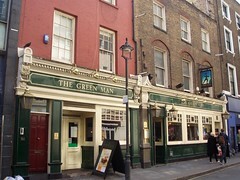 A busy and noisy pub off Oxford Street, at the top of Berwick Street. There's nothing remarkable about this pub, except that it hasn't been done up with any pretensions to the media crowd that dominates after-work drinking in Soho. Instead, it's just a large pub with some booth seating in the back room (away from the bar), and plenty of bar stools. Its location ensures that it gets busy, however, and it doesn't help that sports are shown. Music is quite often very noisy, though it's slightly less so in the back of the pub. On a Friday evening in October, a DJ started spinning tunes in the main room, and turned up the volume to do so. There are several ales on handpump, including London Pride as a regular (£2.80/pint), with a few guest ales (such as Jenning's Cumberland Ale and something else on a visit in June 2008), as well as the usual draught lagers. Prices are as expected for this part of town. There's a food menu as well, basic pub stuff. Last visited by Ewan and work colleagues, 10 October 2008. Last edited 2013-05-10 07:17:45 (version 6; diff). List all versions. Page last edited 2013-05-10 07:17:45 (version 6).